Some restrictions apply currently. The builds are only available for Windows 10 at the time. Windows 8.1, Windows 7, and Mac OS X builds will "come soon" according to the download page; no word on Linux builds at this point in time. Beta Channel builds will come soon for Windows 10 as well. Microsoft is following Google's example when it comes to the available channels. Current builds are available for the Beta, Dev and Canary development channels. These replicate, more or less, the channels that Google Chrome is distributed for. Microsoft Edge Beta Channel -- Updated every 6 weeks. Microsoft Edge Dev channel -- Updated weekly. 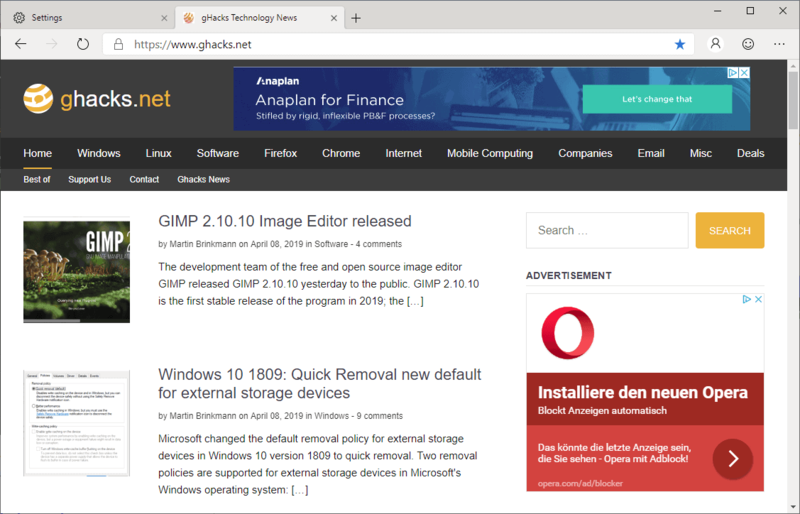 Microsoft Edge Canary channel -- Updated daily. The Canary build of the first version of Microsoft Edge that Microsoft released has the build 75.0.121.1. The latest leaked build's version was lower than that but the feature set is very similar to that build. 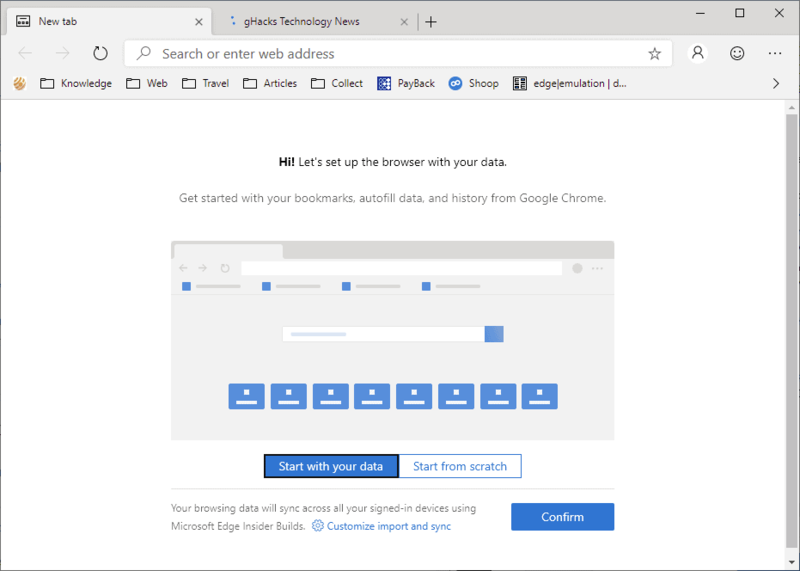 You can check out our initial review of the Chromium-based Edge browser here. Sync, one of the main features that did not work in the leaked build of Edge is still not working, at least not on the machine I tested the feature on. Microsoft's What's New page asks testers to give it a try though. You can install browser extensions from Microsoft's own -- limited -- extension gallery or from the Chrome Web Store if you enable that first. 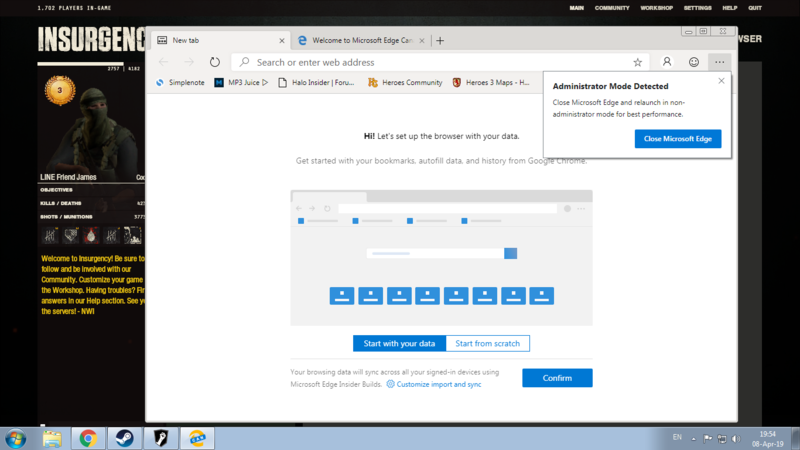 You can enable the installation of Chrome Web Store extensions in Microsoft Edge by going to edge://extensions/ and toggling "Allow extensions from other stores". If you don't want Edge to run in the background toggle the option under edge://settings/system. Instead of having all your browsing data sent to Google, now it can be sent to Microsoft! To web browser makers who think they have the right to collect this ultra private information, we had a saying when I was in the fifth grade. Of course, I am A, and B is the website on the other end of the connection that I am talking to. It is even worse if the vendor of your device or the OS it runs collects web browsing history, because they can then associate it with stuff like your MAC address and/or serial number. They will swear up and down that they would never do this, but we all know what a corporate promise is worth! Sites running in a tab aren’t privy to that information. No, it’s worse than that. Instead of only google getting hold of your data they now both will. Well, on this level privacy is defined as the absence of legally defined PII, and I think there is no real distinction between Google, MS, Mozilla, etc., they all siphon off everything they are allowed to get (and maybe a bit more) to build their big data dream. But neither cliqz collects your personall browser history, nor do google and MS, they collect data for mass aggregation purposes. It all depends on how the data is prepared. The really dangerous part about them having this big data flow is that they can understand how masses of people behave, which is way more dangerous knowledge than to know what kind if websites you as a single person browse. Analyzing how hundreds of millions of people behave makes it possible to manipulate societies on the broader level, because humans in large masses are extremely predictable. This data is used by corporations to sell you more and turn you into a consumer, and by governments to sanitize the web and censor. The easiest way for governments to manipulate big masses of people is to make them believe they are being constantly under survaillance, so that they live in constant fear, as it would be way too difficult to target individual people on this level. Thank you for the heads up Martin. Allwynd, I see they fixed the bugs related to disabling desktop composition (which 7 is the last capable of doing so without breaking any OS functionality and with a proper UI switch for). They’re taking 7 support seriously, nice. do you Block Iranian users to access to this site? i need to use VPN for this. No I don’t but this site uses Cloudflare, maybe it is blocking an IP range? Google Chrome on my Windows 7 x64 ? No thank You ! I got the developer build and haven’t found anything it can’t do compared to a chromium. Somebody’s been watching too many movies or isn’t reading enough or doesn’t practice any form of self realization. Governments can’t manipulate or suppress the masses; the masses manipulate the individual and suppress each other. One, therefore, should learn by listening to others’ thoughts and ideas and understand the irrationality of all thought. Eventually, one achieves a clear mind and disregards opinions, beliefs, fears, wishes, dreams, hopes, desires, etc. because one cannot even assume the existence of the ego or the universe or anything though it may all seem so real. No thank you. I’m sticking with Vivaldi, and brave browser on windows 8.1. No need for the online peeping toms to know what I am looking at. They can keep Edge, no need to infect my computer with their own brew of malware. As for linux, I will use other browsers aside from firefox and chromium. After using it briefly I like it. User interface is very similar to chrome. Looks good, can you install extensions from the chrome store? For me, there is only one difference between Edge and Chrome that matters: you can block ads with Edge on Android, not with Chrome.